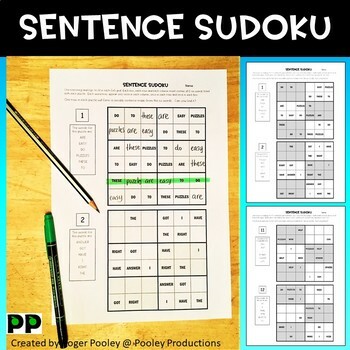 Sentence Sudoku are 6x6 Sudoku puzzles using words. 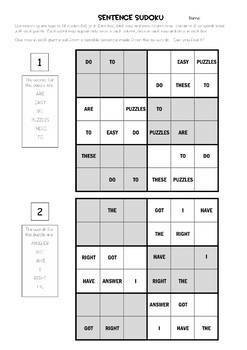 This is a fun activity that can be used for literacy (finding a sentence) and math (logical thinking) centers, as a bell ringer or morning work activity. One row in each puzzle will form a sensible sentence made from the six words. Can the students find them? 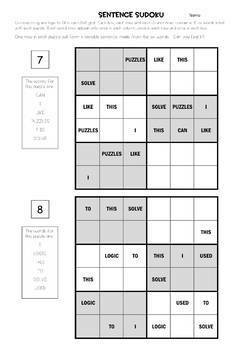 This resource comprises of 12 sentence Sudoku puzzles. In terms of difficulty puzzles 1-2 are easy, puzzles 3-10 are medium and puzzles 11-12 are medium hard. Instructions on how to complete the Sudoku puzzles are provided on each sheet. 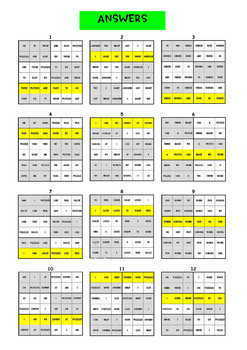 A set of 12 sentence Sudoku puzzles, 2 to a sheet.